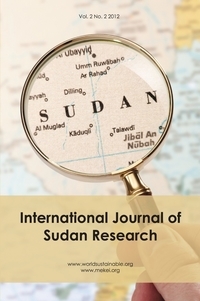 WELCOME to the inaugural issue of International Journal of Sudan Research (IJSR). IJSR is the first international, multidisciplinary, refereed journal about Sudan aims to benefit academics, professionals, researchers, policymakers, businesses, ordinary people, students, etc from both Sudan and the rest of the world with the best available scientific evidence, to enable better understanding of the different challenges facing Sudan. It therefore helps in providing access to information about Sudan. However, it is important to note that understanding the nature of problems, challenges and opportunities in Sudan is a very difficult task for many people outside its territories. Equally important to mention the fact that the current situation in the Southern and Western regions of Sudan is very likely to impact the contributions of different scholars from both regions.